Golfers are final­ly catch­ing on to the diverse ben­e­fits of the best exer­cise pro­gram for both ath­letes and the recre­ation­al sports enthu­si­asts. Tiger Woods, prob­a­bly the great­est golfer of all time; David Duvall (a Major win­ner on the PGA Tour); Rich Beam (win­ner of the PGA Cham­pi­onship 2002); are doing Pilates. Our Olympic ath­let­ics’ are doing Pilates. How and why does this anatom­i­cal and bio­me­chan­i­cal based exer­cise, Pilates, improve sports per­for­mance? Research has found Pilates exer­cis­es train the best known phys­i­cal per­for­mance fac­tors: Pos­ture, Bal­ance, Mobility/Flexibility, Sta­bil­i­ty, Coor­di­na­tion, Func­tion­al Strength and Endurance. These skills are essen­tial for golfers and cor­rect dai­ly func­tion. STOTT PILATES ™ is based on research con­duct­ed by ortho­pe­dic sur­geons and phys­i­cal ther­a­pists world wide. This med­ical­ly researched anatom­i­cal and bio­me­chan­i­cal based Pilates cur­ricu­lum is designed per­fect­ly to enhance ath­let­ic per­for­mance. The basis of this pro­gram is to retrain cor­rect body align­ment with cor­rect mus­cle recruit­ment using breath con­trol. If all these fac­tors are in place move­ment becomes stronger, more effec­tive with greater speed, endurance and accu­ra­cy. Research indi­cates that one of the major sources of back pain is inef­fi­cient mus­cle recruit­ment. The deep core mus­cles close to the joint that should fire first to pro­tect and sta­bi­lize the joint fire too late. This incor­rect fir­ing pat­tern leads to the super­fi­cial mus­cles fir­ing first mov­ing an unsta­ble joint. Super­fi­cial mus­cles aren’t sup­posed to fire first. They are not designed to pro­tect the joint posi­tion. Super­fi­cial mus­cles are to be used to move the joint once it is sta­ble. Mov­ing joints with the wrong fir­ing pat­terns of mus­cles can lead to injury, lack of per­for­mance, obscures accu­ra­cy, los­es speed and weak­ens endurance. Pilates exer­cis­es done cor­rect­ly can help the golfer re-pro­gram the tim­ing of mus­cu­lar fir­ing pat­terns and enhance motor con­trol. There­fore, when train­ing a golfer the STOTT PILATES ™ approach begins with 5 basic align­ment prin­ci­ples and applies this to all the exer­cis­es thus, mak­ing cor­rect move­ment pat­terns. It is then the job of the golf pro to teach the golfer the cor­rect and pre­cise move­ment for the per­fect golf swing and score. Pilates move­ment exer­cis­es do not replace the prac­tice and pro­fes­sion­al teach­ing of any spe­cif­ic sport espe­cial­ly the com­plex game of golf. Our Golf pro­gram starts with the Foot­work on the Reformer. Strong foot align­ment leads to cor­rect foot place­ment and is crit­i­cal for the golf swing. Foot­work is also done on unsta­ble sur­faces to face the chal­lenges of slop­ing con­tours on golf cours­es. We teach cor­rect spinal rota­tion using the essen­tial core mus­cles between ver­te­brae. Strength­en­ing exer­cis­es for cor­rect spinal exten­sion and flex­ion are a very impor­tant part to golf move­ments and a big part of our exer­cise pro­gram. We have a major focus on strength­en­ing knee joints for golfers. Prop­er shoul­der mus­cle recruit­ment is care­ful­ly taught at our STOTT PILATES ™ stu­dio. 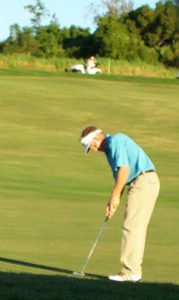 Team­ing up with a pro­fes­sion­al­ly trained Pilates Instruc­tor and your favorite Golf Pro is a win­ning com­bi­na­tion. Let us make your golf game the best it can be.